Could the Middle East hold the answers to the global water crisis? The Marib Dam in Yemen is case study in the complicated relationships between engineering, civilization, and tradition. The original dam was “built in about 115BC irrigated thousands of acres of agricultural land and made Marib rich agriculturally. . . 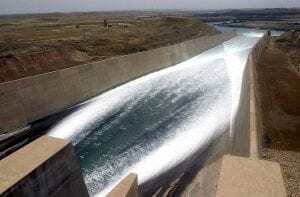 In the 1980s, Sheikh Zayed, the UAE’s Founding Father, offered to fund a new dam” (1). 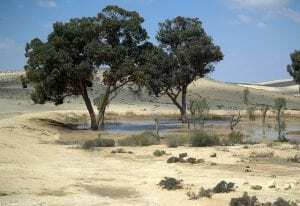 The new dam encountered unintended consequences (2), such as posing a drowning hazard for locals (2), permanently damaging traditional irrigation structures (2), and becoming both a casualty (2) and an instrument of war (1). Yemen’s traditional means for water-efficient agriculture was a system of irrigation which would maximize the monsoon rains. 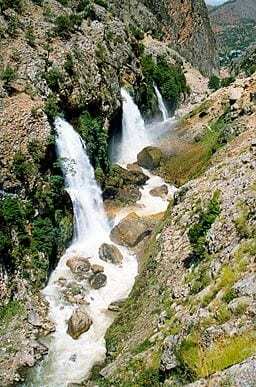 Channels would be dug to capture some of the torrential waters flowing in the wadis. The water pressure would cause the water to penetrate deep into the soil and avoid excessive evaporation and desalinization. 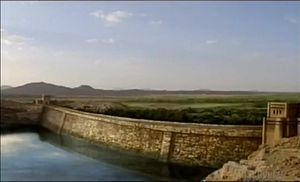 Tiered systems of irrigation are another traditional means of irrigation in Yemen which can be traced back to the Queen of Sheba’s dam pictured above. Unfortunately the roads and other construction necessary to build the new Marib dam permanently damaged these delicate, hand-made structures (2). multiple climatic conditions, from the world’s largest deserts to water-rich areas which feed the Tigris and Euphrates rivers. We will explore these topics in future posts. We will also explore this question at our faculty research forum on water contexts of the Middle East and the rest of the world. Please join us on Feb. 8th.